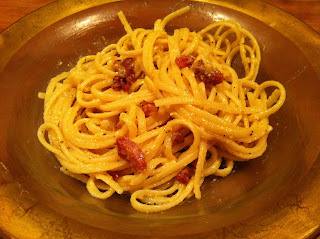 My favorite pasta dish without a doubt is Spaghetti alla Carbonara, and it couldn’t be any faster or easier. Start by cutting two quarter inch slices of pancetta into little chunks and cook along with a couple of whole squashed garlic cloves until lightly browned, turn off heat and leave the pan to cool slightly. While your spaghetti is cooking combine three egg yolks, two cups of parmesan cheese, and a generous grind of black pepper in a large bowl. Next, drain your spaghetti making sure to reserve about three quarters of a cup of the water. Quickly stir the noodles into the pan with the pancetta then transfer all into the bowl with the egg and cheese mixture. While tossing pour the pasta water in slowly to create a creamy sauce…salt and additional black pepper to taste. The best way to visit Rome without getting on a plane.